Neoclassical wedding theme on your mind? Wedding at a French Chateau? A private gathering in a quaint Tuscan bungalow? An enchanting Church wedding followed by a party? I don’t know about you, but they all gently whisper vintage wedding to me. But, first, what are we going to do about the wedding dress? Yes, about that, we have a list of some of the best vintage wedding dresses that you can take inspiration from. If you are ready, let’s go on this ride and get one thing out of the way for your wedding. A mermaid style lace dress in dull white like this is entirely fitting for a church wedding. A vintage veil or a floral accessory will add to the charm. The scalloped neckline and lace hemline are all made to perfection. This enchanting wedding gown in tulle that balloons out so beautifully has a modern charm to it, yet retains its vintage elements. The lace bateau neckline and bodice that soulfully clings to your body before billowing out are breathtaking. A dress that suits plus size brides just as perfectly as it does the petite ones – so it’s open to all, and you can opt for this no matter what your size or shape is. 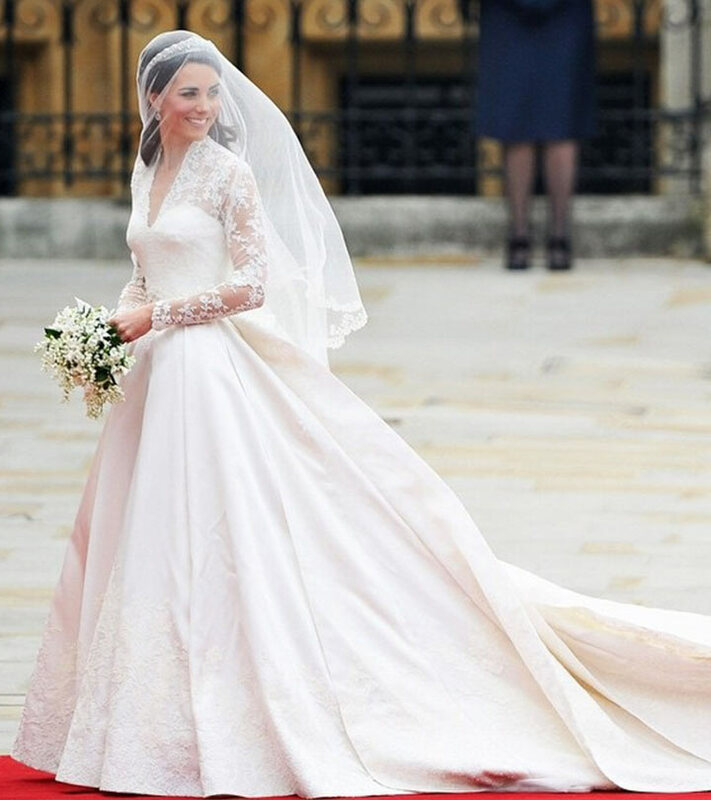 We all have seen and drooled over Kate Middleton’s long sleeved dress. And now, it has found its way back into the bridal racks. This ivory colored long sleeved dress in warm tones evokes vintage romance and sets the mood right for a vintage wedding. The floral lace motifs are a perfect match for the dress. This dress fits at all the right places, giving you a beautiful silhouette. 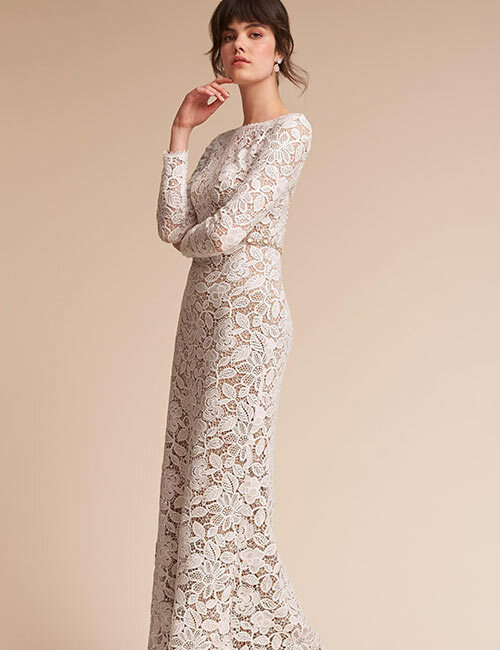 Talk about understated romance with this demure lace dress that rings in a vintage wedding in the most real sense. The lace layers the chiffon insides and peeps out to show off the bodice. This beauty of a dress makes it hard for anyone to look away from the bride. If you have been in two minds and wondering if a short wedding dress will go with the vintage theme, here’s proof that it does and beautifully so. 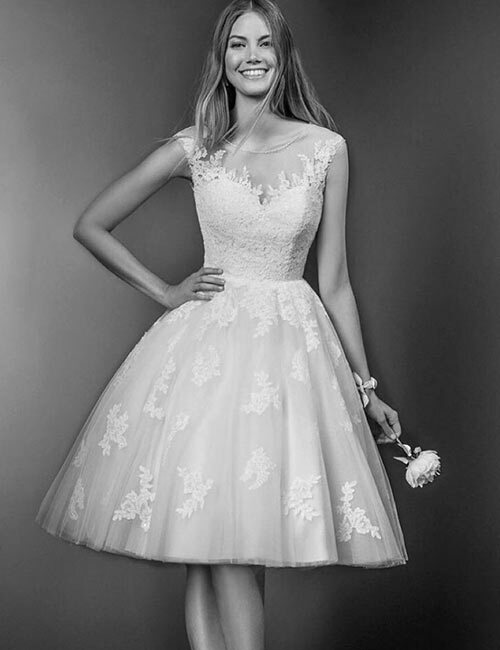 This T-length dress in lace has a sweetheart neckline/illusion neckline and cap-like sleeves that make it equally or more beautiful than your full-blown gowns. Don’t forget a veil to complete this look. Doesn’t this dress just transport you to the Victorian times almost instantly? The flap sleeves add definition and drama to your outfit; after all, we all want to have some fun on the big day, don’t we? 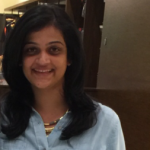 The scalloped deep V neck and the peek-a-boo lace are all things celebratory and festive. This whimsical piece is for brides who are looking for a little zest and trying to inch away from the usual long gowns. Well, if you are looking at vintage themes, it’s different enough, but take it top notch with this T-length dress. The strapless straight neckline in lace is the highlight of this look. And, if you had short in mind for your vintage themed wedding and not a T-length dress, well, this fits the bill. A knee-length dress in whimsical layers and lace applique with dreamlike finesse is truly meant for a dream wedding. 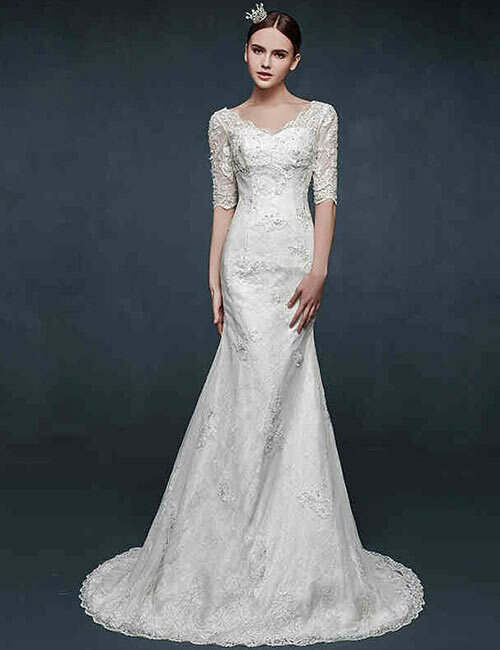 The sweetheart neckline and the illusion sleeves add to the vintage look, and I say, the buck stops here. A wedding gown in dull gold will scream vintage without saying a word. The lace organza dress with lace embroidery will make sure all eyes are on you the whole time. 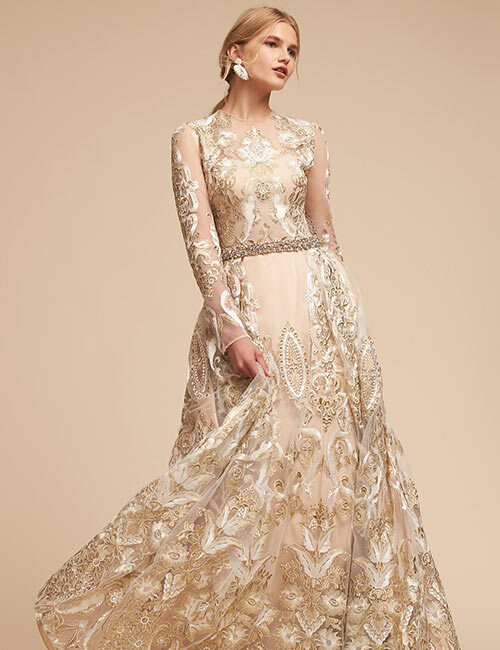 The illusion sleeves, the high neckline, the gold embellished waistband, and the heavily embroidered hemline are all aligned to perfection. A show-stopper for the show-stopper. A gorgeous mermaid style dress that sticks to your body just the way it should and opens out into a mermaid fit, and then ends with a perfect pirouette. The dull silver embroidery all over and heavily embellished neckline marries the look in a way that will leave you looking like a queen from a period film. I think this gown has to be at the top of the list for any bride-to-be, especially if you are considering vintage (or not). It surely is for me. ‘Vintage’ is back, and is one of the most sought after themes even by the millennials – maybe because of its classic vibes. That makes me confess – I cannot think of a better theme for a wedding! What does your dream vintage wedding look like? And, the dress? Let us know by dropping a message in the comment section below.